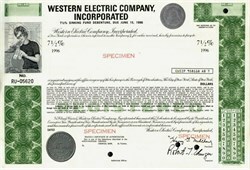 Beautiful specimen certificate from the Western Electric Company, Incorporated issued in 1970. This historic document was printed by the Federated Banknote Company and has an ornate border around it with a vignette of a woman working on an assembly line with a push button landline telephone in her hand. This item has the printed signatures of the Company's officers. Western Electric Company was an American electrical engineering and manufacturing company that served as the primary supplier to AT&T from 1881 to 1996. The company was responsible for many technological innovations and seminal developments in industrial management. It also served as the purchasing agent for the member companies of the Bell System.